A new generation of touch control for your audiovisual installations and home automation systems. AVcontrol is the most advanced user interface you can get. 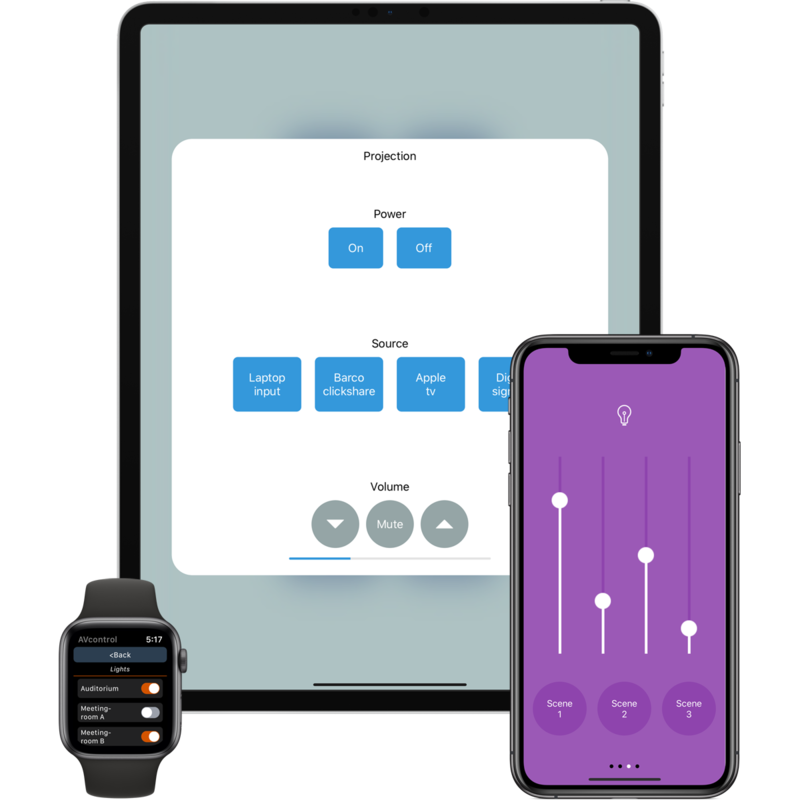 AVcontrol is built for iPad, iPhone and Apple Watch and features native support for all screen sizes. Use a custom defined feature set on your Apple Watch, the fastest way to control your AV. AVcontrol is updated on a regular basis and includes many of the latest iOS technologies. We aim to deliver the best app for controlling your audiovisual control systems. Innovative design that scales across device sizes. Program and design once! Connect via Wi-Fi or cellular network. Control your devices around the globe. Flexible design without the need to install or learn additional development tools. Incorporate native controls such as switches, sliders, lists and so on. You already know how to use these controls. Use multitouch gestures that made iOS famous such as swipes and pan/zoom gestures. No need to design for landscape and portrait. AVcontrol rotates your design with ease. For quick access to functions that you use the most. AVcontrol is just a swipe away. Are your meetingrooms being used efficiently? AVcontrol communicates directly with Microsoft Exchange and clearly indicates room availability. Easily control multiple rooms by placing a dedicated beacon in each room. Pre-configured beacons available upon request. Control systems such as AMX and Crestron have a history when it comes to controlling audiovisual equipment. AVcontrol communicates with these systems to combine the best of both worlds. We believe that traditional AV touchpanels can never compare to the quality and stability of Apple hardware and technologies. As a result AVcontrol has been in the App Store since 2011 and is updated on a regular basis. AVcontrol is built to integrate seamlessly with your existing control system code. There is no need to learn a new programming language or application, everything is done by sending messages to and receiving messages from AVcontrol. Our comprehensive API document covers everything you need to know about integrating AVcontrol. AVcontrol needs a license to work with your existing control system hardware, use the contact form below to request a license quotation. Every license comes with our comprehensive API document and sample AMX and Crestron code. AVcontrol also offers a BYOD (Bring-Your-Own-Device) license to enable multiple devices.